Brought to you by ShopStyle. Looking so elegant and beautiful in this outfit! I like your sunnies and bag very much. The white and blush is beautiful. The heels are so pretty! I can’t wait for the weather to start warming up properly (it did yesterday!) here in Central Europe. 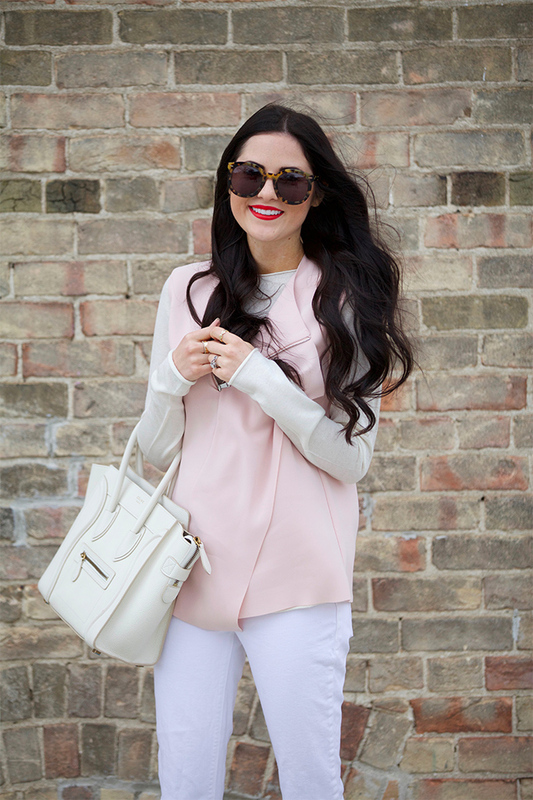 Love this look Rach, white and blush pink looks perfect together and makes a beautiful contrast to your dark hair! Beautiful and chic. I love your sweater. Blush is my favorite right now! Love how you pared it with white, lovely look! gorgeous look! Love the jeans, they are skinny but still look comfy! Such a darling look and you look fabulous in this light pink shade! I am loving all the light colors here – those jeans are especially amazing! I love the blush pink sweater with the white pants. This looks so well put together and polished. Love that top! The shade of pink is perfect! Such a lovely drape top and the color is so pretty! You look beautiful! I love that beautiful sweater! It looks great on you and is the perfect transition piece for spring! its funny how I’ve come full circle with my tastes now. A younger self would be shaking my head in disbelief that I’m so enamoured by that pink! Love these blush tones! Especially the shoes and purse! I love how the look us very girly and feminine, yet the riped jeans give it that casual street look. Omg I LOVE that white Céline. I’m so excited to wear this colour this spring! Gorgeous! This blush color is so pretty, I’m glad it’s so popular this year! Stunning look… those Loubs are just gorgeous! Such a sweet vest! Love the detailing in the front!! Love the outfit and the light colors! Can’t wait for spring! Very, very pretty! I love that jacket for that look. It really does add the perfect little pop to the ensamble. Love all these soft shades on you! I love the color combo, so fresh and clean! And these pumps are a classic! I think blush pinks are your color! Love this outfit. That’s such a pretty top! I love the blush pink with the white jeans. I love the top, looks great on u! Looking so fresh for spring here. Love the color combo, so girly. Love the colours in this outfit! Love the white and blush together. Such a pretty combo for the upcoming spring. 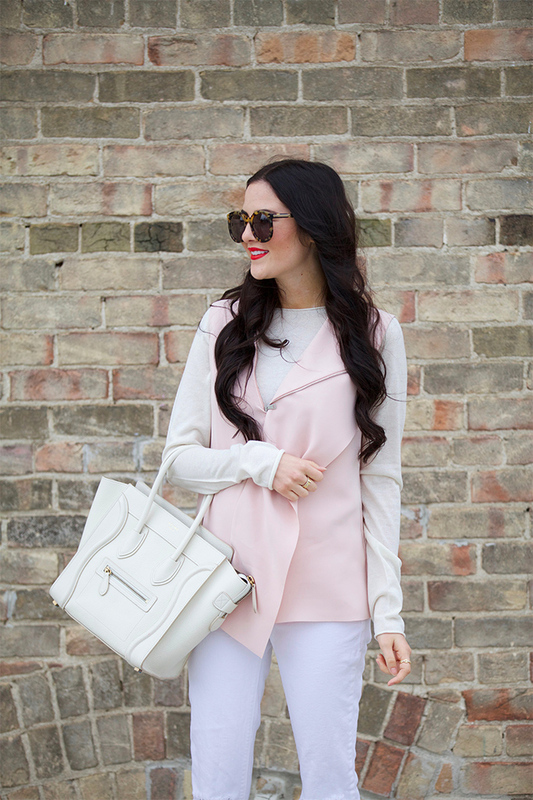 Lovin’ the blush vest, it’s the perfect transitional piece for Spring! I love blush and white together! This is such a perfect look for transitioning from winter to spring. Blush is my favorite shade of pink. It looks great on you! Such a lovely look! I love the all white. It’s perfect topped of with the blush pink. Absolutely beautiful! That Vince top is amazing! Your outfit is so chic and elegant! Beautiful look! Love this shade of pink on you!!! I love that blush top! So feminine and pretty! I also love this colour! It really fits you! Love the white celine bag, it’s gorgeous! I’d defiantly be worried to take it anywhere though. Gorgeous outfit! I love how you’ve layered the different shades of blush & white! Those pink Louboutins go perfectly with this look! So soft and pretty! I love Vince clothes and so happy to see pink – one of my favorite colors too! So beautiful! Love the blush color! LOVE this outfit so much! The shades are beautiful and soft and so feminine! I’m completely obsessed with blush pink too! It’s the color of my ballet shoes when I was little! You look beautiful! Gorgeous fresh spring-y look Rach. I love the color of that blush top! It is stunning.